Magnum Systems has engineered, designed and manufactured quality pneumatic conveying, weighing, filling, and packaging automation systems in chemical handling and processing applications since 1960. Chemicals are used in various processes and we have handled; pebble lime, hydrated lime, fly ash, sodium bicarbonate, soda ash, limestone, bed ash, coal dust, and more. Our state-of-the-art systems provide the day in and day out reliability your plant needs when keeping your conveying and packaging lines moving. 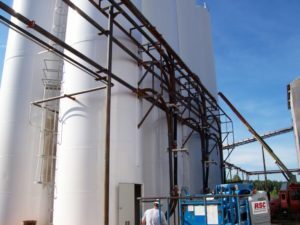 From unloading fly ash from a rail car into a silo or bulk storage, or bagging and palletizing lime for resale, Magnum Systems can provide a tailored solution. Below are some examples of conveying and packaging systems we have provided for various applications in the chemical industry. Project Scope – Dense phase conveying systems including pressure vessels and bin vent filters, controls/PLC, Air Packers, Impeller Packers, Bulk Bag filler, Truck loadout, Robotic bag placing, Robotic palletizing, stretch wrapping. Solution overview– Customer mines raw ore and processes it through a ball mill. The material is a ~9 on the MOH’s hardness scale. Smoot Company installed a dense phase system to take the material from the ball mill to a bank of 8 intermediate storage silos. From the silos, a network of 12 air slides takes material from the same 8 silos to 1 of 3 additional dense phase systems that transports the material to either small bag, bulk bag or bulk truck loadout. The small bag lines include 2 banks of 2 valve bag packers, impeller packers for finer mesh and air packers for coarser mesh materials. Each bank has a robotic bag placer that paces bags onto the fill spouts. The 2 lines run parallel to a single robotic palletizer that places onto 2 different pallet stacks simultaneously at rates up to 16 bags per minute. The finished pallets are then taken to an automated stretch wrapper before being warehoused. Project Scope – The customer required in-line metal detection of the product prior to the bag but at the final point prior to filling the package. The package was a Kraft valve bag and required a tamper-proof food grade seal. Magnum Systems provided a Model A air packer equipped with the Tru Seal Ultrasonic sealer. Inline metal detection was provided by modification to the packer frame and installing an inline product metal detector in the fill spout just before the product in the bag. Solution Overview – This custom metal detection feature gave the customer an added security beyond simply testing upstream or as could be provided by magnets alone and allowed detection of Stainless Steel in the product stream. The entire system was completely automated, with two Model A Air Packers, TRV-1000 Robotic bag placing, a filled bag conveyor system with check weigh and bag conditioning and TRP-3000 robotic palletizer.